How much does Globus cost? Globus is free for researchers at non-profit institutions to use for file transfer, thanks to the generous support of sponsors who fund our research. As a non-profit institution, our goal from day one has been to make Globus a self-sustaining service, so that we can continue to serve the needs of academic and non-profit research organizations for many years to come. Most of our funding is intended for research and early software development, not to cover operation, support, and ongoing evolutionary improvement of the service. As usage grows, our costs have grown and we decided that charging a usage-based subscription fee for additional features that go beyond file transfer is the best way to ensure that we can continue to provide a high-quality research data management service. To this end, certain Globus features are available only by subscribing to a Globus subscription. Such features include the ability to share files directly from existing storage, access to data publication functionality, and performing various administrative tasks for Globus endpoints at your institution. Globus subscription plans also offer higher levels of support from the Globus team, with priority response times. If you are a commercial user, you may use Globus by signing up for a commercial subscription. We are unable to offer the service free of charge to commercial users, but believe that you will find Globus provides valuable capabilities at a reasonable price. Thanks! How do I convert an existing endpoint into a managed endpoint? Important:Globus issues two subscription IDs to institutions with the High Assurance or HIPAA BAA tiers on their subscriptions. One is for standard Globus uses and the other is specifically for High Assurance or HIPAA BAA uses. Endpoints to be used with protected data must be managed by the High Assurance subscription ID. To make your endpoint managed, contact a Globus subscription manager at your institution and ask them to set the endpoint as managed under your organization’s standard subscription or High Assurance subscription, as appropriate. 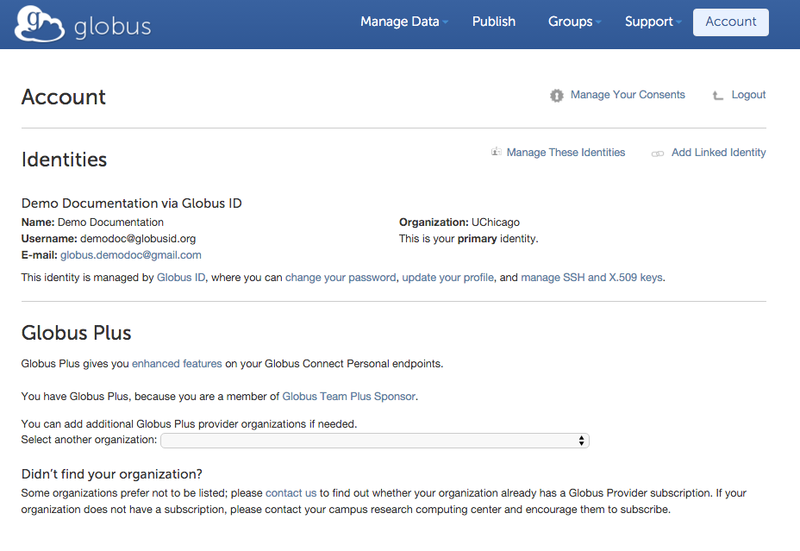 If you need help identifying subscription managers for your institution, please submit a support request to Globus. (Instructions for the subscription manager are provided below.) When you contact your subscription manager, include the following information in your request. State that you are requesting designation of a new managed Globus Connect Server endpoint. If your organization has a High Assurance subscription, indicate if this endpoint will be using High Assurance features. Include the UUID of your endpoint. This will be shown in the globus-connect-server-setup command output for Globus Connect Server 5 installs. For Globus Connect Server 4 installs, the endpoint UUID can be found by looking the endpoint up in the Endpoints page of the Globus web app, and then checking the "Endpoint UUID" field in the endpoint’s Overview tab. After submitting the request, you’ll need to wait for a response that your endpoint has been made managed before proceeding. The subscription manager at your institution can go to the Endpoints section of the Globus web app and search for the UUID you provided. When the endpoint is found, click the "Update Managed Status" button to set the endpoint managed with the standard subscription ID or the High Assurance subscription ID, as appropriate. $ globus endpoint search --filter-scope my-endpoints "My Endpoint Display Name"
Please ensure that <username> has subscription management rights, otherwise the command will fail. Note that a subscription manager can only create endpoints under their own account. You must have a current Globus subscription to be granted subscription management rights. If your Globus account does not have subscription management rights, please contact support@globus.org so that we may enable your account. If you do not have a Globus subscription please contact us to sign up. What is Globus Plus? Do I need it? Globus Plus enables you to transfer files between two personal Globus endpoints, i.e. computers on which you have installed Globus Connect Personal, such as your laptop and a desktop personal computer. Globus Plus also allows you to share files from personal Globus endpoints. You do not need Globus Plus if transferring files to/from a Globus server endpoint (e.g. your campus cluster or supercomputing center), or if you want to share files from a Globus server endpoint. How do I get Globus Plus? Your Globus account may be upgraded to Globus Plus by associating it with your organization’s Globus subscription. Go to: www.globus.org/account/Plus, select your organization from the list and follow the instructions. Depending on your organization’s policy, you may be directed to complete a request form or send email to an administrator. Once you have Globus Plus, visiting the above link will show your institution as in the example below.